Jessica is the creator of Nacho Average Fro, a platform that seeks to encourage others to live their best life by identifying and removing obstacles. Through her website and her popular “Minimalism Monday” series on Instagram, she has established herself as an encouraging, consultative resource that provides direction for others desiring to be more engaged in their own journeys. How did you find minimalism or did it find you? Minimalism found me. I had reached my wits end with my job and I was desperate for something that would help me find purpose in my life and distract me from the stress at work. After finishing a book about mindfulness, Audible recommended, Essential: Essays by The Minimalists. I was hooked from the second I started listening. So much of their story aligned with mine, it was scary. After hearing what minimalism has done for them and seeing how drastically their lives had changed, I decided to take on a 21-day minimalism challenge. I didn’t fully believe that it could change my life, but I figured that things couldn’t get any worse. Thankfully, it changed my life for the better. I really only have one goal, which is to be true to myself. Before minimalism, I was doing what was expected of me regardless of whether or not it aligned with who I was, what I desired or what I enjoyed. Living simply allows me to re-write the rules and tailor my life to fit my goals, wants and needs. What does your minimalism look like? Has it impacted other areas of your life? My minimalist journey is based on 3 principles: being free, radical and original. Everything I do and declutter goes back to one of the following - freeing myself of baggage that I’ve carried over the years, trying out new/radical ideas in an attempt to question why I do or believe something and honing in on what makes me unique. This journey has impacted me in so many different ways. If it weren’t for minimalism, Nacho Average Fro wouldn’t exist, I wouldn’t be a vegan, and I’d still be wasting money and food continuously. What, if any, surprises or challenges have you encountered? The biggest surprise was realizing how much I am capable of. There were A LOT of things I used to tell myself I could NEVER do. Now, I realize the only thing that was holding me back, was that mindset. I have significantly reduced trips to the mall, I have decided to stop eating animals and animal products, and I even gave away my TV at one point. If you had asked me 2 or 3 years ago to do any of those things, I would probably would have laughed at the idea. You recently visited Italy, how has traveling impacted your minimalist journey? Travel continually opens my eyes to the conveniences that we often take for granted in the US. It also makes me realize that many of the conveniences we cherish are keeping us from reaching our full potential. I do more walking during a short trip abroad than I ever would in the US. I also make better use of my time because in many other countries late night food and a variety of services are not available around the clock. It seems to me that other countries have a better quality of life because they truly value their time and their health. I admire that. Jessica created and hosted the first annual Visionary Conference in December 2018. I’ve learned to tune into my body. I can’t say that I always listen, but I realize more and more that my gut always tells me what’s right for me. I’ve also learned that every decision matters. We often think that 1 bad food choice, 1 more piece of clothing, or 1 more purchase we really didn’t need is okay, but the truth is that all of those things add up – for better or for worse. Go slowly. I tried to take on my 2bdrm/2bthrm apartment in 3 weeks and that was way too much. Between identifying the clutter and figuring out what to do with it afterward, this is a big undertaking. The more you can break it down, the easier the transition will be. Try not to rush the process. You host a weekly minimalism challenge and do IG lives on Mondays, can you tell us more about why you started this challenge and how it has helped you and the Nacho Average Fro community? I started “Minimalism Monday” because I’ve often felt alone throughout my minimalist journey. Based on my own experience, I realize that minimalism has the power to change lives, but I think, for many that can be overwhelming. Without having a community or accountability partner, many people will shy away from something like this. I want people to feel like they can talk with and lean on someone who understands exactly what their experiencing. The weekly challenges help break down what can seem like a really big task and make it more manageable. I’ve had several followers reach out to me with excitement about how freeing it is finally let go of their stuff. I’m looking forward to continuing this series and helping more people live simply. 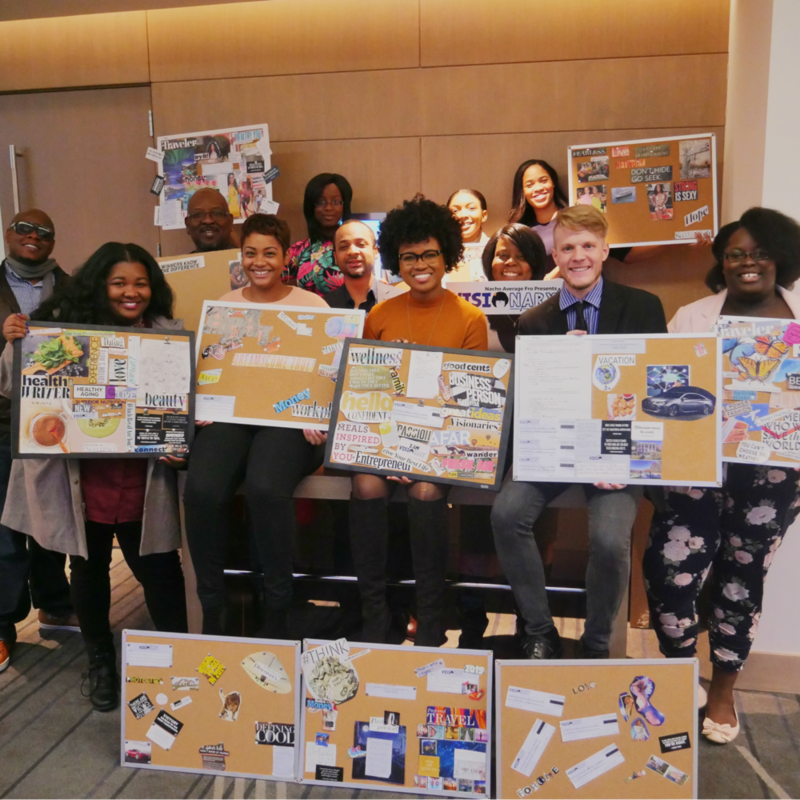 Participants created vision boards at the 2018 Visionary Conference. 2018 Visionary Conference Happy Hour. What does liberation look like to you? Liberation is freeing myself from the status quo. Things like, wearing my natural hair to my corporate job, creating a capsule wardrobe, cutting cable and opting out of email marketing from major brands make me feel free. These things give the freedom to think for myself and I love that. Being a black minimalist means redefining being black and being a black woman. There are so many stereotypes about black people and black women that I don’t subscribe to or align with. Staying true to myself and sharing my story with others shows the variety that exists within the black community and also helps those who are like me, feel that there is a place for them despite what the media would have them believe. The group participated in an escape room challenge. Panelists and participants at the 2018 Visionary Conference in Denver, Colorado. The Visionary Conference was a great success! Why did you decide to create your own conference and what was its purpose? What were some challenges and triumphs throughout the process? Will you host it again? It was! I still can’t believe I created a conference! The goal of The Visionary Conference is to help people get clear about their purpose and their goals and determine what it will take to accomplish them. There are a lot of conferences out there that have similar goals, but often times they are SO BIG, that the participants just become a number. 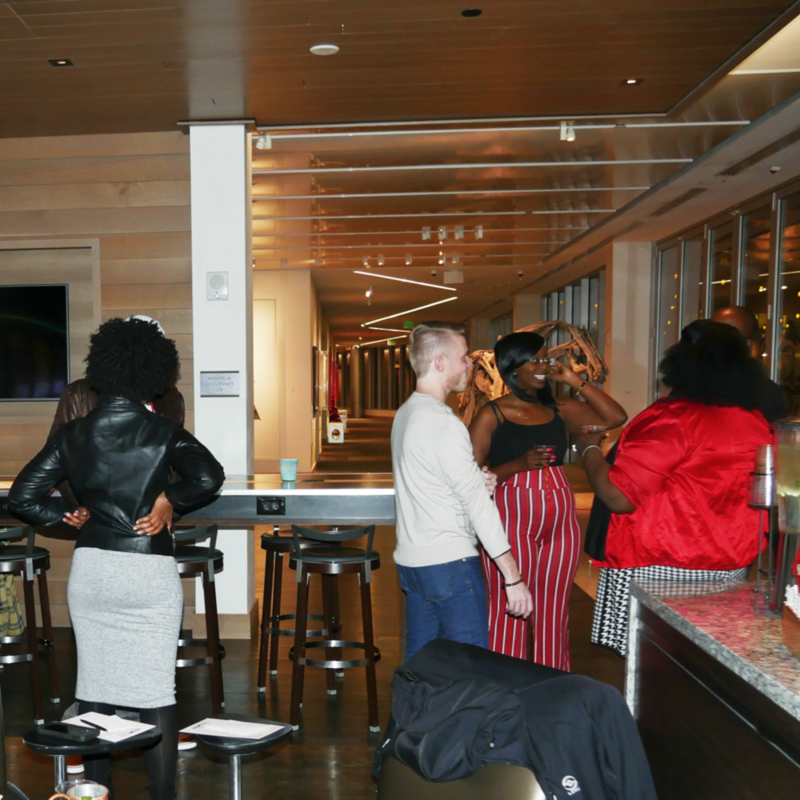 Visionary is an intimate event and we pride ourselves on creating a close knit community that allows our participants and panelists to network and learn from one another by having in depth conversations about how to create change in their lives. The biggest challenge was coordinating all the pieces. I was in Dallas, while planning an event that would take place in Denver and communicating with team members and panelists all over the country. Everything was done virtually and I never even saw the hotel until I arrived in Denver. That was kinda scary but it was also exciting to realize that I could manage a project with so many variables. The greatest triumph was the culmination of the event. This was a huge undertaking and when everything was finished, I was so proud of how this idea evolved from a note in my journal to a 3-day weekend full of in depth conversations and tourist activities for our panelists and participants. The 2nd conference will take place this December in Houston, TX! I think it will be even better than the last and I can’t wait to share more details as things unfold! You can read more about my journey at www.nachoaveragefro.com. To keep up with me in real time, check out my Instagram, @nachoaveragefro or like my page on Facebook. Thank you Jessica for sharing your minimalist story with us! If you would like to share your story, click here.